At last, a real alternative to non-biodegradable food and drink plastic packaging waste could be within the world’s grasp. 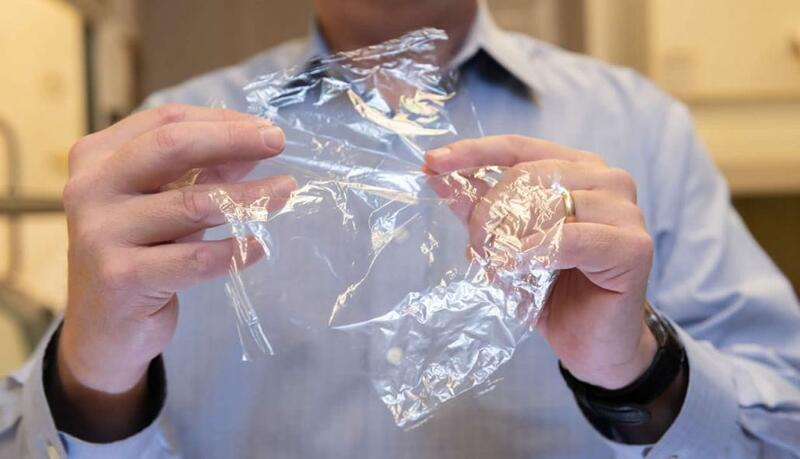 It shouldn’t be necessary to spell out that the implications of this are colossal and it’s hoped that everyday, disposable plastic items such as drinks bottles and flexible food wrapping could soon be a thing of the past. Whilst we’ve already talked about deposit return schemes and other ingenious alternatives to using plastic, a viable substitute to this incredibly useful and versatile substance really needs to be found… and soon. Yep, the amazing material in the leading image of this article is indeed made from chitin (from crab shells) and cellulose (from trees). So, how can stuff from trees and shells end up looking like thin, clear plastic? Well, in order to explain this, we’ll need to get slightly geeky, so bear with us. Cellulose is an organic compound that is an important structural component of the primary cell wall of green plants and many forms of algae. It’s the most abundant organic polymer on Earth and is mainly used to produce cardboard and paper and it’s also the main constituent of cotton fibre. Chitin (pronounced KY-tin) on the other hand, is a derivative of glucose. Whilst being similar in some respects to cellulose, it’s a primary component of cell walls in fungi and in the exoskeletons of creatures such as crustaceans (e.g., crabs, lobsters and shrimps) and it’s also abundant in the insect world. The development of this new plastic-substitute appears to largely be down to research carried out by Dr Carson Meredith from Georgia Tech’s School of Chemical & Biomolecular Engineering. The clear, flexible substance that resembles plastic in appearance is comprised of cellulose nanocrystals from wood pulp and chitin nanofibers from crab shells. It’s made by spraying numerous alternating layers of chitin and cellulose on top of each other until the end product is formed. Dr Meredith explains that he uses PET (polyethylene terephthalate) as a benchmark to compare the new material to as PET is one of the most common petroleum-based materials that are currently in widespread use in everyday drinks bottles and food packaging. Aside from being a viable alternative, it can also provide up to a 67% reduction in oxygen permeability over some forms of PET. What this means is that it could actually be BETTER than plastic as it may well keep food fresher for longer. In other words, the less that food is exposed to oxygen, the longer it will keep. Dr Carson Meredith is a professor in Georgia Tech’s School of Chemical and Biomolecular Engineering. Dr Meredith and his research team created a method of suspending cellulose and chitin nanofibers in water and spraying them onto a surface in alternating layers to form a thin film. When left to dry, not only is it flexible and strong, it’s also transparent AND compostable. They’d already been studying cellulose nanocrystals for several years as a way to improve food packaging but they’d also been studying chitin nanofibers for an unrelated reason when they had the bright idea to see if chitin could also be used to advance their research. Geek Fact Alert:- Nanocrystals and nanofibers are materials with a measurement in the nanometer range, which is one billionth of a metre. In other words, one nanometre is 0.000000001 of a metre. In order for this new material to compete with existing packaging on price, new ways must be found to scale up production to reduce costs. There is also the problem that methods of chitin production are at the early stages of their evolution so it will be difficult to compete with the already established, low-cost production of plastic for packaging. According to Meredith, there is also some work to be done to make this new, revolutionary material more capable of blocking water molecules from passing through it. With the world’s focus firmly fixed on the problem of waste disposal, particularly concerning plastic and our ability to recycle and reuse it, it always refreshing to hear about new ways to produce suitable eco-friendly alternatives. As we mentioned earlier on in this article, the new “wonder plastic” is better at preventing oxygen from passing through it compared to conventional plastic. The reason for this is that it acts as a really effective gas barrier because of it’s tiny crystalline structure. …assuming we don’t kill all the trees and marine life first!